FIGURE 1. The orbit of 2003 EH1 is highly inclined at an angle of about 71 degrees and approaches the orbit of Jupiter at its furthest point from the Sun. On December 08, the International Astronomical Union has issued a telegram with the announcement that the parent body of the Quadrantid meteor shower has been discovered in an orbit among the meteoroids. Peter Jenniskens is quoted as saying "2003 EH_1 (cf. MPEC 2003-E27) would seem to be a very strong candidate for the parent of the Quadrantid meteoroid stream." The Quadrantids are named after the constellation Quadrans Muralis, a now defunct constellation on the borders of Ursa Major, Draco, Hercules and Bootes. This is our strongest meteor shower with Zenith Hourly Rates as high as 130 per hour. It is the only major shower without a parent body. 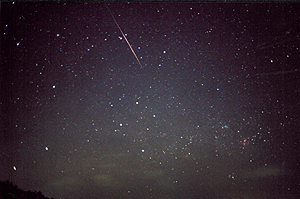 FIGURE 2: Quadrantid meteor near the constellation of the southern cross. Photo by Frankie Lucena, Puerto Rico. The Quadrantids are not visible from the soutern hemisphere. However, when you live in Puerto Rico, you can on occasion see a Quadrantid flash in the constellation of the southern cross. This rare photograph was obtained on January 4, 2003, byFrankie Lucena. 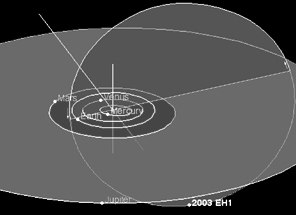 Peter Jenniskens identified the object, called 2003 EH1 (meaning the 33rd minor planet to be discovered in the first half of March 2003), among recent minor planet discoveries after searching for a parent with an orbit similar to that of the meteoroid stream. 2003 EH1 was first seen by the LONEOS "Lowell Observatory Near-Earth Object Survey" on March 06, 2003. The true nature of the object could only be reveiled after several other institutes followed up on these observations in the next 48 days and the preliminary orbit was updated. The stream is very massive, however, about 10,000,000,000,000 kg. That is about 100-1000 times more mass than lost by a typical Jupiter-family comet in a single orbit. The young age of the stream only squares with that amount of mass if the meteoroid stream found its birth in the breakup of a comet about 500 years ago. Isihiro Hasegawa has pointed out that Chinese, Korean and Japanese observers recorded a bright comet in January of 1491 (C/1490 Y1) with an orbit similar to that of the Quadrantids. This is in fact in the right timeframe for this breakup to have occurred. Efforts to match the orbit of 2003 EH1 with the perihelion time of C/1490 Y1 in January 1491 have been unsuccessful to date due to the many close encounters with Jupiter that can greatly change the result of backward integrations for even very small changes in the initial orbit. Further observations are needed to establish this link. Nov. 20 - A bacterial fingerprint? Results of this research were published in the Astronomical Journal.